This is a summary for Brinley from 23.5-24 months old, also know as two years old! Brinley moved into a new stage. She moved into the “try to delay sleep by any means possible” stage. This is when you get to see your child’s imagination and genius come out. This is when you teeter between being impressed with how bright your child is and being angry that your child won’t just lay down and go to sleep already. She would ask for a different song in the middle of one the song you were singing. She would suddenly need socks. She would need her drink filled up (she sleeps with a sippy of milk WATER. I accidentally put milk originally, but it is not milk. It is water. I have literally never put a child of mine to bed or nap with milk. That is a slope I don’t want to start down. However, I do let them all have water in bed. I like water by my bed and figure they will, too). She would see something out of place in the room that needed to be put back. She would need more kisses and more hugs. Then more kisses again. Finally, I would feel like a big jerk and tell her no more kisses were allowed and that this next kiss was her last kiss. Then when she asked for “mas” (yes, she speaks Spanish when she says “more” at bedtime), I would tell her she already had more and that was it. Then I would cheerfully tell her good night and to sleep well while she started yelling for “MAS!” She would cry for about 30-60 seconds after I closed the door. Then she would go to sleep. My husband and I both got very consistent and stuck with the same routine no matter what her requests were. Even after a couple of weeks, she is still persisting in trying to delay her sleep by trying out new tactics. She definitely has some tenacity in her. Playing was good here. We did have a big development for independent playtime–Brinley learned to open the door. So she was having IPT one day and then showed up in Brayden’s room (his is right next to hers). He told her to go back to her room, and she did. Of course, this happened on the one day of the week I shower after she is awake (cleaning day) and I was in the shower. I am glad it was at least during the summer and that she went to Brayden first! He is responsible and he doesn’t give in to her (Kaitlyn is responsible, but a sucker for a sad face. McKenna is a party girl and would be thrilled to have Brinley show up during IPT). The next day, I put her in and told her she needed to stay in the room. She did, but she opened and closed her door a billion times. Each time, she put a toy in the hall outside her door. 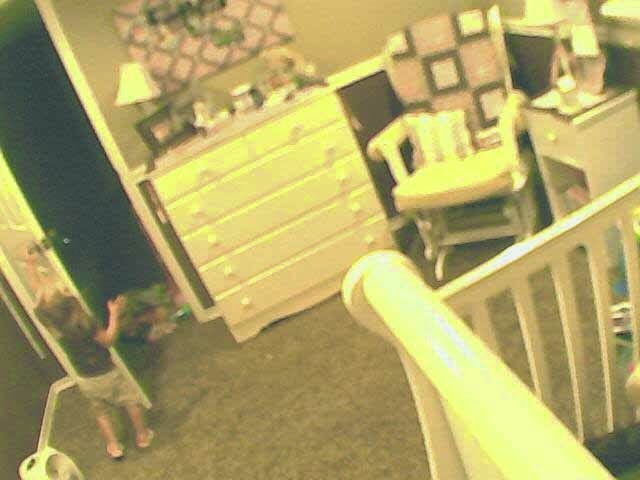 You can see below–her toys are piling up outside the door. Then it dawned on me. I suddenly remembered what I did when my other kids learned this special ability of opening doors. I put a child lock on the inside of her door knob. It doesn’t take terribly long for them to learn to use the child lock, but it does seem to buy enough time that by the time they are able to open it, they are also better at obeying and having self-control. I am not usually one who likes to do child-proofing–I prefer house-proofing the child. In this instance, however, I really like IPT to be a time I can get things done so that I can give more attention to the child when it isn’t IPT. I don’t want to battle during IPT (see House-Proofing: Pick your battles). We had a vacation in Park City with my husband’s family (by the way, I have to say, that Park City, Utah is not a terribly family-friendly place to be. I haven’t really experienced the dirty looks for having a lot of kids living in Utah, but apparently Park City is an exception. People obviously did not approve of us having more than our allotted 1.5 children). Anyway, while there, we were in a room with large bunk beds. Nate and I were on bottom and Brinley was on top (in her Pea Pod). The bed was very creaky. Every time Nate or I would move, we would feel so paranoid that our creaking would wake her up. She is a light sleeper. But she did great. Brinley suddenly got an interest in watching TV during this time period. She likes to watch Elmo’s World. I love seeing these summaries it really helps me with my daughter who is now 14 months old. I'm a very visual learner and need examples to help me understand and plan things. I was wondering if you would be willing to take pictures of Brinley's room or explain what is in her room. I want to transition my daughter from independent playtime in her crib to room time but I'm at a lose as to what to do with her room. I have no idea how to store her toys, what to do with her changing table and diaper supplies, etc… And as I mentioned I need examples to be able to figure things out and you are my go to source for help and advice. I love this blog and it has helped me with raising my daughter more than words can ever express. Just wondering how long her nap lasts for? Your daughter and mine are close in age…i love your blog and appreciate all he help you have already given me! This is such a great resource! Hi Vicky, she usually sleeps 3 hours. She does vary more than any child of mine has varied–sometimes I wake her after 4 hours and sometimes she wakes after 2. She is usually 3 though. My daughter is just three months older than Brinley. When we potty trained a month ago we took a break from IPT. Since potty training is complete, we've been back doing IPT in her room with a gate. However, she will not call to me and tell me she needs to potty. So almost every other time she has an accident during IPT. What solution would you use? Access to the bathroom? Move a little potty into her room? Although I'm not sure that she wouldn't end up playing with the little potty instead. Thank you for all your advice. This is my favorite mommy blog! Jennifer, thanks 🙂 I have put a potty in the room with my kids. I put it on a towel. If you have a video monitor, you can watch her to know. You could try allowing her to get out to go potty. She might abuse it but might not. You could also do a diaper, which isn't my favorite solution. lol @ Brinley. My daughter comes up with the same crazy ideas. I love toddlers. They keep things interesting for sure. Good idea Catalyn! I will do it. Ack! Sorry! That is a huge typo! She sleeps with a sippy of water. Not milk. Sorry–that is what I get for not proof-reading 🙂 I would leave a sippy of water with her, but no milk.